Lois M. Ramondetta, M.D. and Deborah Rose Sills, Ph.D.
"You know what? my friend said, defending the present, "it couldn’t hurt." (The phrase, andit just might help, was implied but unspoken). Maybe in and around CancerLand, there’s more than a handful of cancer survivors guilty of this sort of magical thinking: as in, if I’m a very special patient, and my doctor really likes me, I’ll thrive on whatever he/she prescribes and put off The Talk for as long as humanly possible--that dreaded conversation between cancer doctor and patient that includes the sentence, "I’m sorry, but we’ve done all that we possibly can." Yes, it’s true. Cancer survivors develop a very special relationship with their oncologists. And isn’t that the way it should be? After all, the disease is chronic and often life threatening. Many of the treatment protocols can include a long list of side effects that have to be managed over time. So it shouldn’t come as too much of a surprise to learn that some oncologists’ offices may be decorated with lots of special gifts and personalized mementos from their extremely grateful patients. Sometimes material objects can provide that special way of saying thank you and at the same time acknowledge just how long and difficult the path to recovery has been. 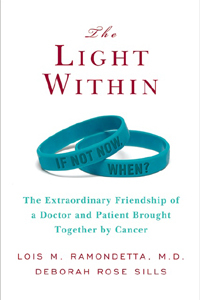 Which brings me to The Light Within, a very moving story of an eight year long friendship between an oncologist and a patient diagnosed with Stage III ovarian cancer. Lois Ramondetta is an attending physician and associate professor of gynecologic oncology at the University of Texas M/D. Anderson Cancer Center. Her patient, Deborah Rose Sills, worked as a professor of religion at California Lutheran University in Thousand Oaks, California until her death in 2006. The two women first meet in the hospital in 1998 when the patient refuses to take a preoperative laxative. Over time, through varied surgical procedures and many rounds of treatment, the relationship between doctor and patient moves beyond the boundaries of office visits and grows into a close personal friendship. They visit each other’s homes. The patient offers a toast at the doctor’s wedding. The ladies travel abroad. They co-author articles, co-present at professional conferences and ultimately decide to write A Light Within together as the patient’s health begins to fail. "You know, Lois, Deb told me, "if things go well in the course of one’s cancer treatment, one has a long and intense relationship with one’s oncologist. If they don’t, one has a short and intense relationship with one’s oncologist." "I began to notice that some of my fellow oncologists were also being drawn-sometimes against their will-into similarly deep and spiritual relationships. Our patients were living longer and we had time to get to know them as people, not simply as patients." The Light Within is a page-turner of a book that immediately draws you in and keeps you reading. It flows easily, from one woman’s perspective to the other, and back again, with the patient’s words presented in italics to distinguish them from the doctor’s. These are real people that the reader comes to know and care deeply for. Each woman has an authentic, distinctive voice that lingers long after the book ends. The Light Within has a strong message to share with various groups of readers. For doctors and nurses entering the field of oncology, it offers an opportunity for lively debate and discussion. What are the dangers of forming such a close relationship with a terminal patient? Is a close relationship like the one described in the book defensible? What are the benefits to both the doctor and to the patient? Is a more sensitive, spiritual bedside manner the new model for oncologists of the future? To quote Dr. Ramondetta, "The reason for writing (the book) was not to document my medical life or your cancer life. Nor was the book written to further either of our careers…It is a celebration of our friendship…"
Hospice workers will find the final chapters of the book both moving and relevant to the topic of palliative care. For patients, it is an opportunity to see the oncologist/patient relationship through a caring doctor’s eyes. Maybe the best way to close is with one more bit of magical thinking: what cancer patient hasn’t fantasized that they are their doctor’s only patient? And honestly, what higher compliment could you possibly pay your oncologist if that’s in fact the way it feels?